The following video is John Pieper’s discussion of the February 2018 Uniform Bar Exam and how to prepare to re-take the exam in July 2018. The following document is the handout to which John Pieper refers in the video above. After a week or two of feeling like you’ve been kicked in the stomach and the whole world is staring at you, you need to take two courses of action: figure out how to read your score sheet to discover why you failed, and come up with a game-plan for passing the next Uniform Bar Exam. It can be difficult to start studying again if you don't know where you went wrong the last time. That's why it's important to understand your score. 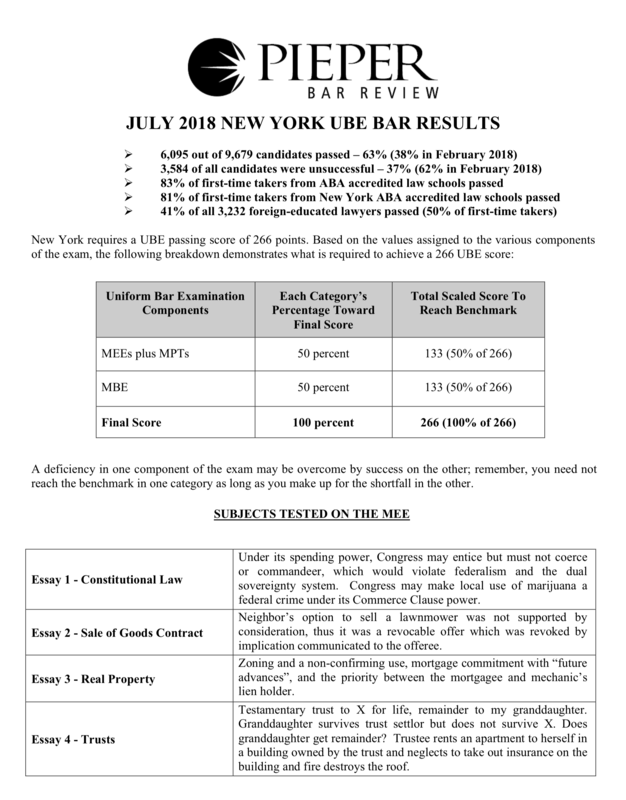 John Pieper, founder of Pieper Bar Review, explains how to break down your score sheet from the New York Board of Law Examiners in the video above and goes over what your score goals should be for the UBE in February. With respect to the written portion of the exam (essays and MPTs), for instance, you’ll be looking for a total scaled score of 133 or higher. If you didn't achieve that, then your written average weighed down your overall score. By going through each of your essay scores, you can tell which essays or MPTs helped or hurt you. If your “Scaled Essay Scores” were in the 50’s or higher (or to be even more precise, above 47), they were helping you rather than weighing down your overall score. Similarly, you were looking for a MBE score of 133 or higher (if your scaled MBE score was below 133 it was weighing you down). To give you an idea of how you performed relative to the rest of the country on the MBE, you can take a look at your “% Below Nationally” numbers. There, higher numbers are better, and you’re looking for a “TOTAL” number of roughly 30 or higher to achieve a scaled MBE score of 133 or higher. If you scored an 82 in Contracts, you outperformed 82% of candidates across the country in Contracts (solid work!). If you scored 5% in Real Property, you really struggled and only outperformed 5% of people who took the MBE (i.e. 95% of the people who took the exam did better than you). If your overall scores suggest, for example, that your writing needs improvement, be aware that you can still pick up points on any section of the exam to improve the overall score. Therefore, it is essential to take a balanced approach to studying for the bar exam and start blocking off as much time as possible to study. Your biggest ally in passing the exam is time, so start thinking about things you can do to free up your schedule as much as possible over the next few months, especially as the exam approaches. The more time you have to study the material and practice bar exam questions (as torturous as that is), the better your chances of making this the last time you take the exam. We also strongly encourage you to take a full bar review course again. If this was your first time taking the exam, it’s likely that you may be entitled to a free course from Pieper, BarBri, or Kaplan. If so, you need to do some soul searching to figure out what is going to help you learn the material better than you’ve ever known it before. That may very well mean that switching courses may be your best option, even if it costs you money. After all, how much is that course worth to you if you don’t end up passing the February exam? What are you really saving? The time, expense, and emotional capital that you invest in re-taking the bar exam is considerable. While you can save cash by enrolling in a course that failed you for free, what is it going to cost you in time? What will be different about the course this time that will propel you to a passing score that it didn’t last time? If you have failed the bar exam, and feel like your bar review program failed you, it is worth it to invest in a new program that will give you a comprehensive course that will get you ready for the next exam. If you fail again, what did you save? At Pieper Bar Review, we take a personal approach to helping you understand what parts you will need to strengthen in order to get to a passing score. As the most respected bar review program in New York, our staff is adept at teaching students how to achieve success on the New York bar exam. We can get you on track to pass the exam once and for all. Remember, Pieper People Pass.